Targeted therapy and immunotherapy are more specific treatments than chemotherapy. This means they may cause different side effects from those usually linked with chemotherapy. Chemotherapy side effects usually include infections, weakness, and changes in blood counts. Targeted therapy and immunotherapy side effects may include skin, hair, nail, and/or eye problems. Targeted therapy is a treatment that targets the specific genes, proteins, or the tissue environment that contributes to cancer growth and development. Some targeted therapies can cause specific side effects to the skin, hair, and nails. These side effects are caused by the drugs' effect on the healthy growth of these tissues. The following are some of the types of targeted therapies that may affect the skin. If your doctor prescribes a targeted therapy, ask what side effects to expect and how they will be treated. Drugs that target EGFR. This common type of targeted therapy focuses on a molecule known as epidermal growth factor receptor (EGFR). EGFR fuels the growth of cancer cells. It also plays a role in the normal growth of the skin, hair, and nails. This means rashes and changes to the hair and nails may occur during treatment with these drugs. Most patients taking drugs that target EGFR develop a rash on their face and upper body. It usually occurs within the first few weeks of taking these medications. You may notice redness or a warm sensation like a sunburn before the rash begins. After several days, tender pimples and pus bumps appear, and the surrounding skin feels slightly tender. Rashes tend to be mild to moderate. However, some people have severe rashes that cause major physical and cosmetic discomfort. The skin can also become very dry and itchy, interfering with daily activities and sleep. Skin on the fingertips may crack. Skin may also become more sensitive to sunlight. A lot of scratching can result in breaks in the skin. These openings make the skin more prone to infections. Inflammation around the nails can make grooming, dressing, and other activities painful or difficult. Drugs that target VEGF. Another type of targeted therapy that may cause skin problems includes drugs that block a protein called vascular endothelial growth factor (VEGF). This protein helps make new blood vessels. This group of drugs may also be called angiogenesis inhibitors because they block the formation of blood vessels. When these drugs affect the blood vessels in the hands and feet, they can cause skin problems. Your health care team can help you manage these side effects so treatment can continue. Managing these side effects can also help avoid major changes to your skin, hair, and nails. It is important to note that the skin side effects linked with these drugs are not allergic reactions or infections. Below is a list of common targeted therapy drugs that can cause skin related problems. Immunotherapy is also called biologic therapy. It is a type of cancer treatment that boosts the body's natural defenses to fight the cancer. It uses materials made either by the body or in a laboratory to improve, target, or restore immune system function. Many side effects are similar to those of an allergic reaction. They depend on the specific drug a person receives but may include skin, hair, nail, or eye problems. Below is a list of common immunotherapy drugs that can cause skin related problems. Alemtuzumab (Campath). This medicine is used to treat chronic lymphocytic leukemia. Side effects include mouth sores. Rituximab (Rituxan). This drug is used for non-Hodgkin lymphoma and chronic lymphocytic leukemia. Skin-related side effects include redness, tenderness, swelling, or warmth of part of the skin. Rashes, dry skin, and nail and hair reactions are rarely severe. But they can cause major discomfort. Patients may even want to stop cancer treatment because of these reactions. It is important to talk with your health care team about what to expect. Also tell your doctor as soon as you start feeling or seeing any side effects. There are early and effective treatments for these reactions. Before you begin treatment, talk with your health care team about the side effects. You may wish to talk with a dermatologist. A dermatologist is a doctor who specializes in skin conditions. Ask what to do if a rash or other problems appear. This may include how to get a prescription filled or the best way to see the doctor. At the first sign of a reaction, tell your doctor or a dermatologist familiar with these reactions. Signs of a reaction include a warm or burning sensation, pimples, nail cracks, or dry skin. Avoid the sun, and use a sunscreen with a sun protection factor (SPF) of at least 15. If the sunscreen causes a burning sensation, you can try sunscreens that contain zinc oxide or titanium dioxide. Remember to use enough sunscreen. Apply more than half a teaspoon of sunscreen to each arm, your face, and your neck. Apply just over 1 teaspoon to your chest and abdomen, your back, and each leg. Re-apply sunscreen every 2 hours when outdoors, or more often if sweating or swimming. Use a broad-brimmed hat if going outside. And avoid being in direct sunlight between 10 AM and 4 PM. Use a mild soap in the shower. Avoid soaps with strong scents. Shower with lukewarm water and avoid long, hot showers. Also, avoid laundry detergent with strong perfumes. Apply a cream-based moisturizer to all skin within 5 minutes of showering or bathing. Use hypoallergenic moisturizers that do not have perfumes or preservatives, such as Vanicream, Aveeno, CeraVe, Cetaphil, and Eucerin. Avoid anti-acne skin products containing alcohol or retinoids. They can dry out your skin. Your doctor may prescribe medicated skin creams to effectively relieve symptoms of rash. If the rash is severe or covers a large area of the body, you may need oral corticosteroids, such as prednisone or dexamethasone (multiple brand names). Antibiotics, usually taken for 2 to 4 weeks in pill form, are an effective therapy for rashes and nail tenderness. Whenever there is discharge of pus, your doctor may want a sample to determine the appropriate antibiotic treatment. Use creams containing urea called carmol 20 or carmol 40, salicylic acid (Salex cream kit). Strong corticosteroids such as fluocinonide (multiple brand names) and clobetasol (multiple brand names) are also options. Wear thick, comfortable socks and shoes, or try gel insoles. Also, do your best to protect against injury. Don’t put too much weight on your hands and feet, especially during the first 2 months of treatment. For itching in one specific area, called localized itching, apply a cream containing a corticosteroid or a numbing medicine, such as lidocaine 2% or cooling creams containing pramoxine (multiple brand names) or camphor/menthol (multiple brand names), several times a day. For more generalized itching or itching that affects sleep, talk with your doctor about taking an antihistamine pill, such as cetirizine (Zyrtec) or diphenhydramine (Benadryl), as needed. 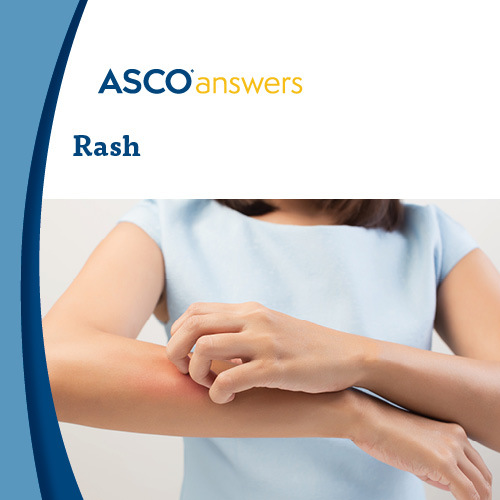 Download ASCO's free Rash fact sheet. This 1-page printable PDF gives an introduction to rashes, including symptoms, how it is treated, ways to manage discomfort, words to know, and questions to ask the health care team. It also includes a tracking sheet to record when the rash started and where and how it appears. Order printed copies of this fact sheet from the ASCO University Bookstore.